Last night Paula and I went down to the lake to enjoy the lakefront and have a picnic. BTW, awesome food sweetie. So we were walking around afterwards and taking a few pictures of the Kenosha skyline at sunset, when I noticed something strange next to a vase. 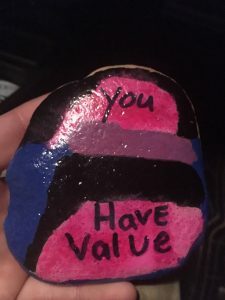 Paula picked it up and it was a painted rock. So apparently, this is a thing. PeoplePaint rocks and hide them. When you find it you post a picture and then re hide it, a very cool idea. So here is the one we found. I really liked this idea, I may even paint a rock myself. Paula’s daughter will re hide the rock today. 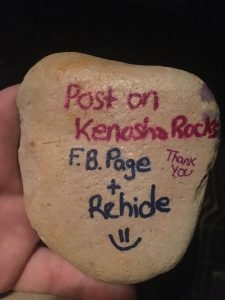 If you are interested in more information I will like to the facebook group Kenosha Rocks. This entry was posted in Explore, Photos, travel, VanLife and tagged adventure, camper, campervan, camping, explore, explorer, greatoutdoors, Kenosha, Kenoshaharbor, livingsmall, outdoors, photography, travel, traveler, traveling, vanlife, vanlifestlye, wanderlust on September 12, 2018 by prudenttraveler. I had this great idea to build a box to place on top of the van to carry all my camping gear. I could then just pull the box down when I’m not on the road and all my gear could easily be stored in one place. I ran into an issue with raising and lowering the box, it was heavier than I expected it would be. So I decided to build a lift for that purpose. Here is the video for that project. This entry was posted in CamperVan, Camping, Explore, travel, VanLife and tagged adventure, camper, campervan, camping, explore, explorer, greatoutdoors, livingsmall, outdoors, photography, travel, traveler, traveling, vanlife, vanlifestlye, wanderlust on September 11, 2018 by prudenttraveler.